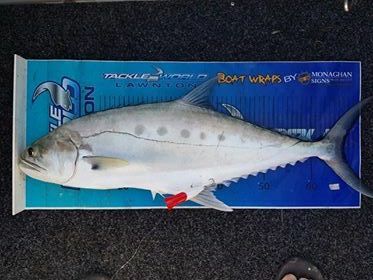 I was lucky enough to be spending a week at bribie island over the christmas break and had a full itinerary planned for chasing jacks through the passage. After an extremely quiet first day with no fish landed, I hit the water at first light the next day to have a look at some shallow water action on my way to some jack grounds. Within minutes I saw some serious fish busting up and knew I had struck gold! So I locked the min kota and started throwing poppers. For the next few days I followed giant 1m+ queenies around the flats, watching them in full flight just amazed at these beautiful fish being right in the heart of SEQ. Time after time I was getting fish following my river2sea 60mm popper with only one hook up so I kept switching from one surface lure to another to try find what they would take as well as changing retrieve style. After 2 solid days of fishing I decided I needed to try something else as the fish were still extremely active but not liking what I had to offer. So I went straight to allround angler in Caboolture and grabbed a few 80mm roostas then set out. Almost like magic my hook up rate shot up and I was hooking some serious fish but again nothing landed. That night while prepping my tackle I noticed all my roostas had slightly bent hooks so I buggered them off and threw on some decoy and bkk size 4s and awaited another day of pain staking popping. After several days fishing for them, I had started to pick up when they were most active and where the bait was schooling at what times. So almost like clockwork, about 2 hours before high tide, right up in the shallows near some rocks in around 1m of water they appeared and I knew it was my last day to get one before the weather changed. And just like that, only a few casts into the action I was on! He was peeling line off my 3000 like it didn't have any drag to offer. After 5 heart pumping minutes of him going under and around my boat we had him onboard. I was like a kid seeing a magic show just amazed by this silver giant. It measured in at around 75cm so wasnt one of the big models but I was still over the moon to get what I was after. After a quick measure and photo I had him in the water swimming. The bigger fish struggle after the ordeal as they will fight till they die but luckily we got him wanting to kick out of my hands after several minutes and we parted ways. The fish were still hungry so I kept casting and only a few minutes later got a nice mid 50s GT on the same popper. That day really cemented that nothing in the fishing world beats local knowledge and being aware of your surroundings. If I hadn't kept watching the tides, bait and where the fish preferred to eat I surely wouldn't have got the fish I wanted. The gear I was using was a 3000 shimano nasci loaded with 10lb j braid and 15lb black magic flurocarbon attached to a dobys savvy 6-12lb. It was very light tackle for some of the fish there, but if they were hesitant to hit 15lb you have no hope with 25+. My lure of choice was a halco roosta 80mm in red and white using a fairly fast retrieve with minimal pause between each sweet of the rod. Get out there to the flats and find some for yourself!